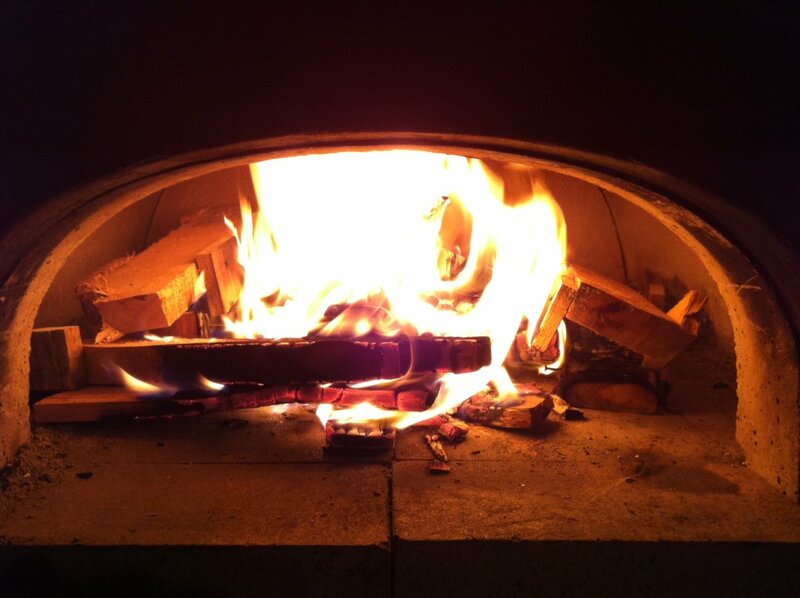 Once you experience the amazing hardwood infused flavor that only an outdoor wood fired oven can deliver, you wonder why you ever considered using a gas or electric oven in the first place. At least at my house, you find yourself experimenting with baking garlic to slow roasting pork shoulders. As reviewed previously, I added a Round Boy outdoor wood fired oven as a foundation for my Pandemic Preparedness Primitive Outdoor Kitchen. 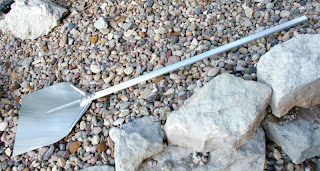 I has been without question the best $1700 I have ever spent on any home improvement, gas or charcoal grill or any other cooking implement, but I soon realized that I was in need in a few tools to move food and flame around. 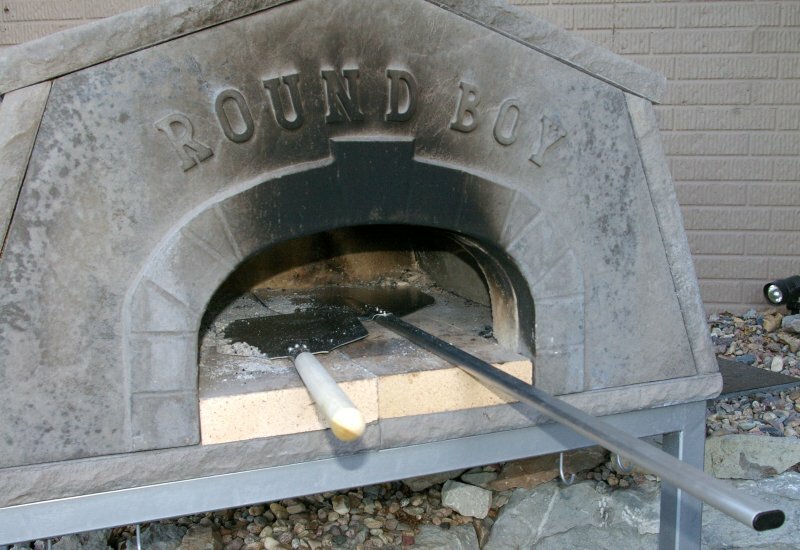 Around our house, our Round Boy wood fired outdoor oven receives the same use as our Weber grill and perhaps a bit more as the weather turns colder. Unfortunately the elitist foodie crowd has driven the price of most of basic pizza oven tools into a stratospherically moronic price range. 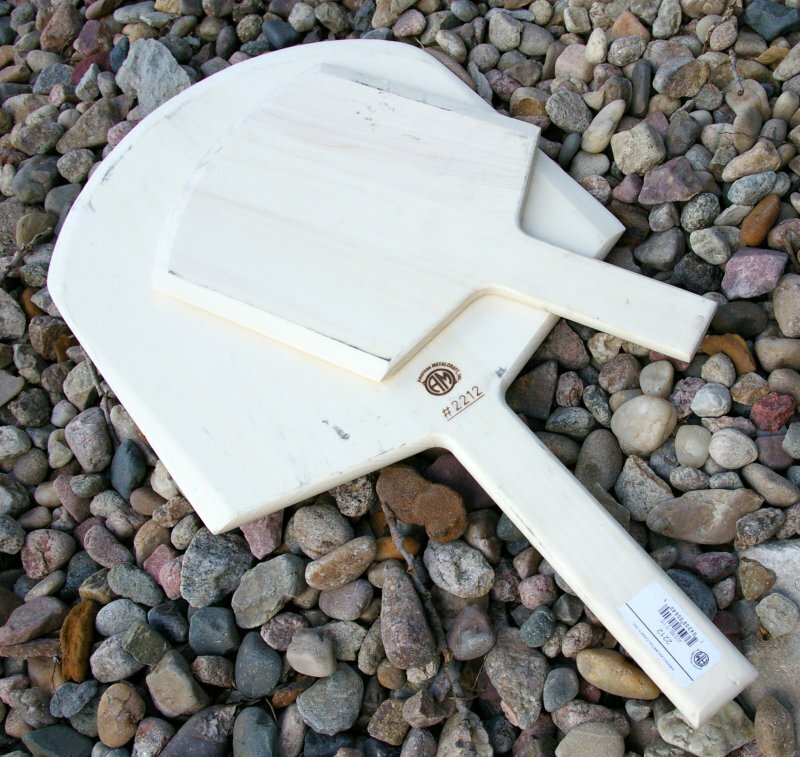 I actually saw a $175 pizza peel, really? This pushed me out of Gourmet Magazine’s ads back into restaurant supply companies. After seeing a lot of made in China sourced products, I found American Metalcraft which makes everything right here in the USA. There a couple tasks you need to do if you have an outdoor wood fired oven; place and move around wood, move around and scrape up and remove ash, make and place pizza, breads or anything else you may be cooking, turn the pizzas or breads and remove them. In my case, I found a set of welders gloves and a DIY pizza peel were not getting the job done. The first mistake most people make to to buy one of the huge wide peels that you see in the pizza shop. In case you have not noticed pizza shops have 4’ wide ovens which are well over 3’ deep which they move around XL and XXL pizzas; most home pizza ovens have at most a 16” wide door opening and only about 9 square feet of internal space, of which, some room is taken for the wood. The tip I will give you is to not go for a peel any larger than ⅔ the width of your oven’s door width if you expect to have any room to maneuver. Moving and turning anything in the oven while it cooks requires a certain level of maneuverability and a with a big pizza peel you feel like you are taking an 18-wheeler through a drive-through. A 9” bladed peel will handle even 12” pizzas just fine, however if you consistently make a lot of larger pizzas a 12” bladed peel for final retrieval/removal can be handy. 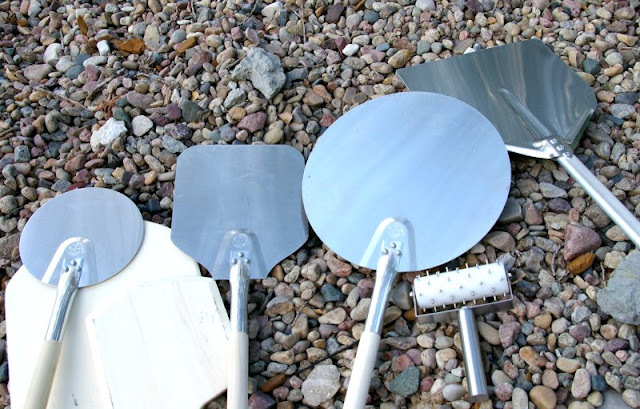 I have found that a 9” bladed pizza peel is the right size for the home pizza oven chef as most people will want to make several different smaller sized pizzas versus just a couple larger ones. So one giant pizza peel will not do it and in this case we now know smaller is better, but due to the variety of the above cooking tasks, you will need more than one peel. 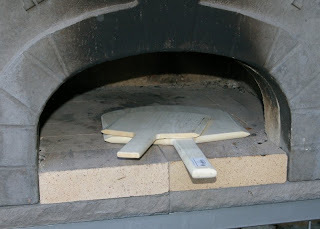 A smaller square 9” peel is perfect for moving wood around in the oven, removing ash and scraping the brick before a pizza is laid down, and retrieving and placing breads and pans all for far less than a set of very expensive cast iron “oven tools”. The square peel it is not the best shape for turning the pizza though through the cooking process due to the confines of the home oven. Round peels on the other hand have a hard time getting into the corners, scrape, or moving the wood around, but excel and helping you turn the pizza during cooking. 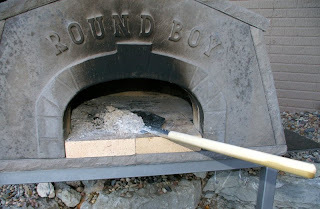 Round peel are better at removing the pizza at the back of the oven that is done without disturbing the pizza up front and without also scraping up ¼ cup of ash in the process. The reality is that one 9” square peel, a 8”-9” round, and 12” round peels have been the perfect combination for my Round Boy wood fired pizza oven. 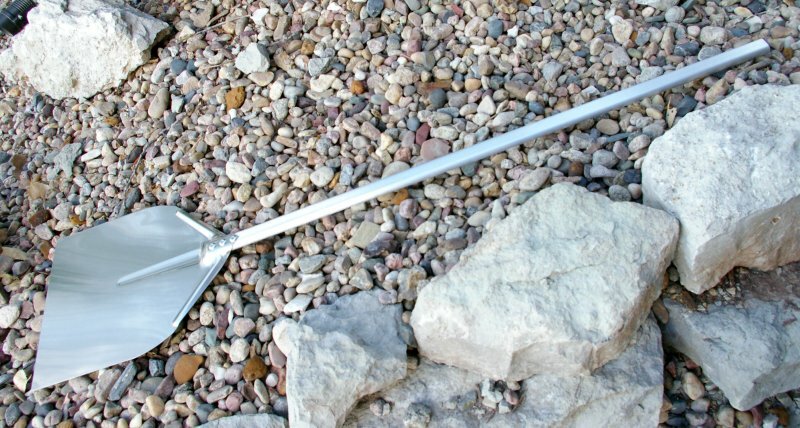 That noted, I also purchased a very long handled 14.5” bladed all aluminum peel which I is invaluable only for those really big pizzas, but I still use my short handled 9” round peel to turn those big pizza. 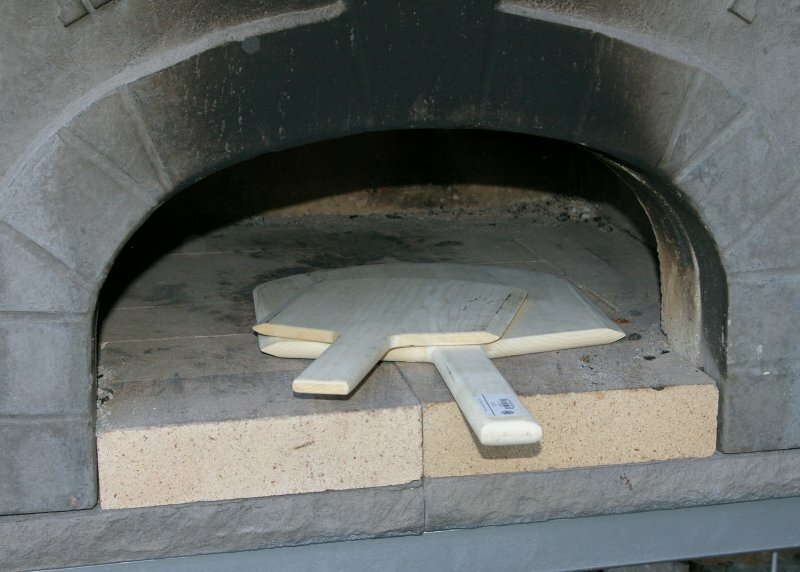 If you have made the investment in a wood fired oven, then I would suggest investing about $100 in several pizza peels so that you have much more flexibility during your cooking cycle and enhance your enjoyment considerably. Assembling a pizza was also a learning experience for me and I taco’ed/burrito’ed more than a few pizzas sliding them into the oven after making them on corn meal laden metal peels. For some reason dough sticks more readily to the metal peels than the wooden ones, however obviously the wooden ones do not hold up to the heat so you need both. Makes sure you mineral oil your wooden pizza peels to keep them water resistant and easier to clean otherwise you will have to straighten them from warping after you wash them off - lesson learned. Although not from American Metalcraft, heavy leather welders gloves are one the best $20-$30 investment you can make for your oven and allow you to reach into the oven and move burning logs or pick any up that may fall out of the oven during cooking prep if required. For the best price and quality see your local welders supply retailer and stay away from the fancy food and gourmet retailers for this item. A few other accessories I picked up at American Metalcraft were half a dozen aluminum restaurant style 9” Couple Pizza Pans. This are beyond handy to slip a finished pizza onto for the hungry guest to run upstairs to devour. Plus they will not blow away, are totally indestructible, dishwasher safe, and add a little pizza kitchen touch to serving. For those that like a deeper crust or less pocketed dough, a dough docker is the prefered tool to prolifically perforate your dough and ready it for saucing. American Metalcraft makes what I have to believe is the most durable dough docker in the world which should easily survive the next three global apocalypses and it is also dishwasher safe. If you want that perfectly uniform crust without all the extra pockets and bubbles, then this is your tool. 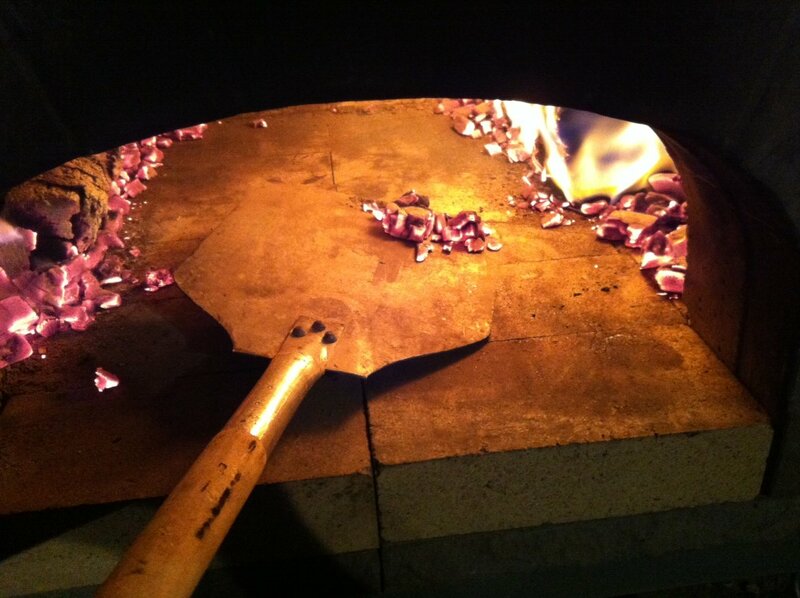 Having the right tools for the job makes the easy task of wood burning oven cooking just that much more enjoyable. 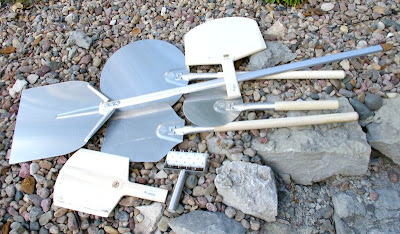 I searched long and hard for an affordable set of cooking tool and believe American Metalcraft is the best deal for an all American made product and their product line depth is stunning.